Fig. 1.1. Back Roads and Bridges of the Elliott. Left: Southwestern Oregon Community College (SWOCC) bus goes over a bridge near Elkhorn Ranch, April 17, 2018. Right: Indian Point ridgeline road access previously used as trail route to the Johnson Indian Allotment, June 4, 2018. Both photographs by Tara Boyd. PLEASE NOTE: The current condition of roads throughout the Elliott are not suitable for some vehicles, limiting access to potential recreators. Many of the roads have washed out edges, or potholes greater than four feet in diameter with washboard surfaces and brush along the sides. Except for a few miles of paved road from Highway 38 to Loon Lake, all of the road surfaces are rock. In addition to poor road conditions, there are no directional signs and most available road maps are very poor or even misleading. Caution and awareness of these conditions are important for people who may be visiting the Elliott for the first time, or wanting to explore its many historical roads and trails. 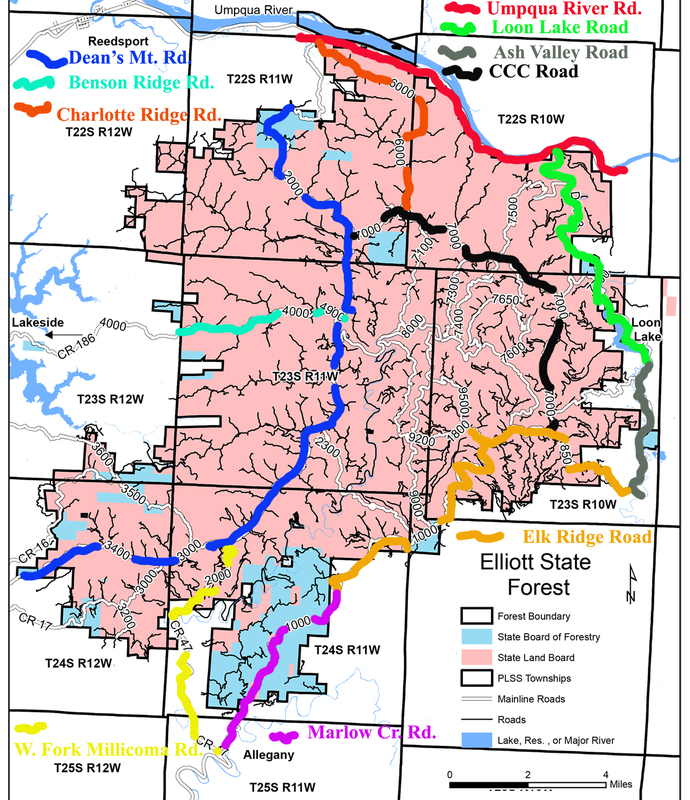 As of now, there are over 500 miles of roads and trails throughout 93,000 acres of the Elliott State Forest (Jerry Phillips: personal communication, May 1, 2018). Current roads and trails date back to the beginning of the Elliott State Forest in 1930. 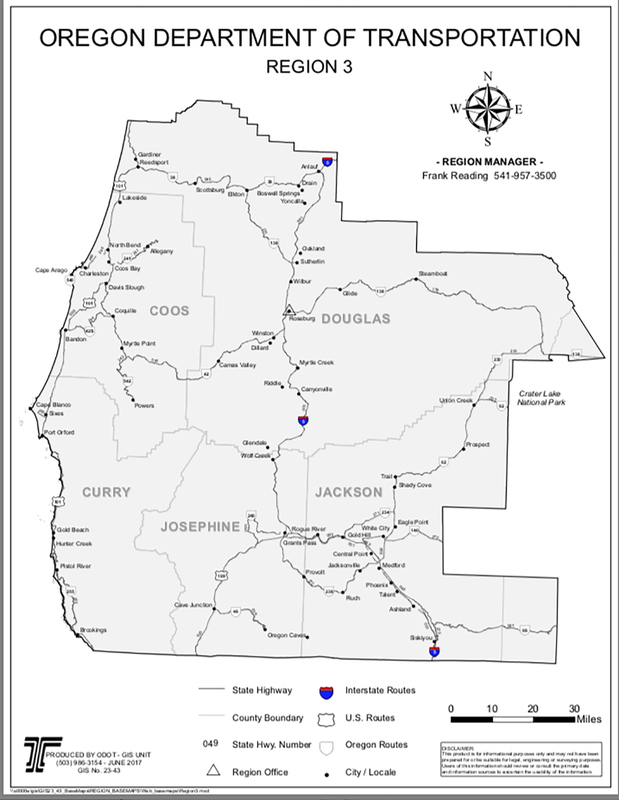 Ridgeline and riparian trails used by local Indian families for generations were developed into pack trails and wagon roads by white settlers in the 1800s, and initially established as automobile and truck access for logging and fire lookout towers beginning in the 1930s (Bob Zybach: personal communication, June 4, 2018). More recently, roads and trails can be used for transportation to get to specific areas to recreate. An expert currently volunteering time and effort to maintain the roads is David Gould. Gould receives rock as a donation from a local company and uses his personal machinery to maneuver the donated supplies. Gould stated the overall cost to maintain current roads and trails is estimated to be $100,000 per year (Gould: personal communication, April 17, 2018). Good directions for entering the Elliott from major access points are given by Hargan (2016). Table 1.1. Local Time and Distances to Elliott Access Points (Source: Google Maps). In 1934, the Civilian Conservation Corps (CCC) built Muddy Flats Side Camps and the road previously known as Umpcoos Ridge Road, now known as the 7000 (Phillips 1998: 62-87). Roads such as the Benson Ridge (3000) Road and Deans Mountain (4000) Road were primarily used for logging but can be used for the public to access to their desired location for recreation. Map 1.2. 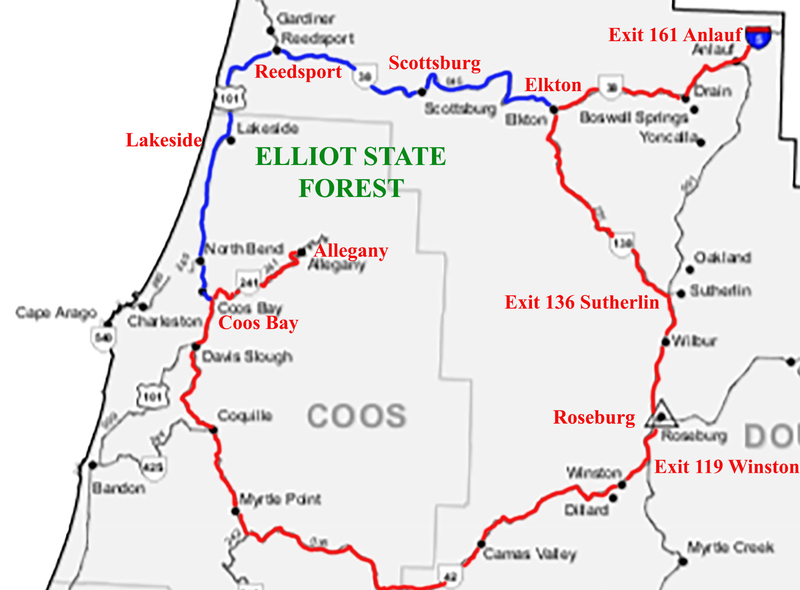 Principal Travel Routes Within the Elliott (Oregon Department of Forestry 2015 base map). When suggesting fixation to these roads, there are various concerns that could potentially put a halt to the development and improvement of the recreation access. Roads determine where and when the public will or will not recreate. The public would likely want to know where the materials to fix current road conditions will come from, who will maintain the roads, and how maintenance will be completed for future generations. Solutions to the current road conditions could raise questions among the nearby residents. The public and maintenance companies will want to know where the money to fund these improvements will come from. 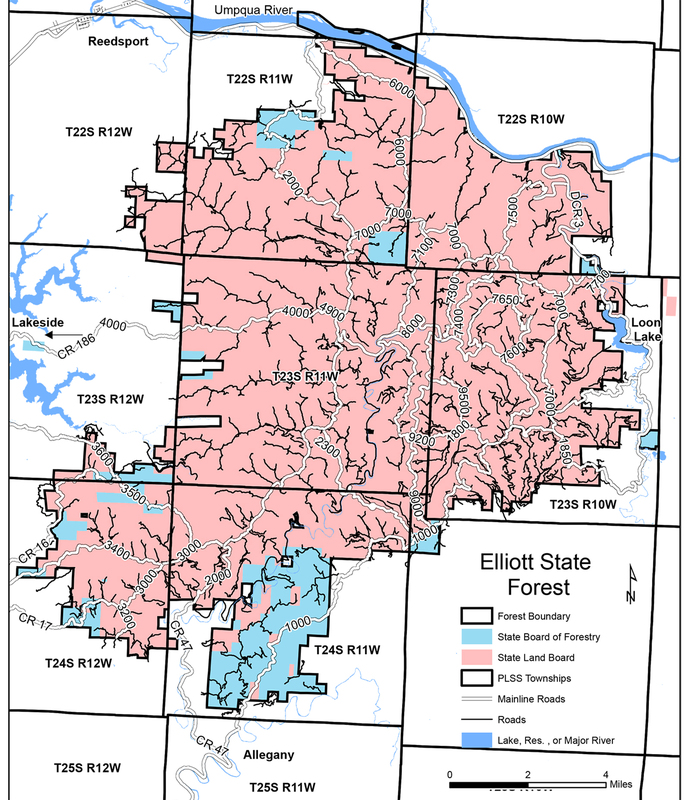 Locals may ask if roads within the Elliott State Forest will affect them even if they do not partake in recreation. Improved safety along roads and trails comes at a relatively low cost. Installing directional signs will assist visitors if they become lost while spending time in the Elliott. Directional signs will increase the likelihood of someone being located within the State Forest. Cost for directional signs vary dependent on the size of each sign. Large guide signs can be $20-$25 per square foot. According to Oldson (2016: 23), potential funding sources for signage include, but are not limited to, Oregon Department of Transportation, Travel Oregon, and Oregon Community Foundation Grants. The state forest could also install gates to prevent visitors from entering an unwanted area. Similar to a bordering timber harvesting site, Weyerhaeuser, the Elliott State Forest could implement fees to receive access to certain areas within boundaries. Craig Richards (personal communication, June 14, 2018) stated the cost to install a gate similar to that of Weyerhaeuser would be around $1600. A fee of $150 per gate entrance tag would help fund the gates while providing profits. The profits could be used to maintain roads while benefiting visitors by providing signs for direction. 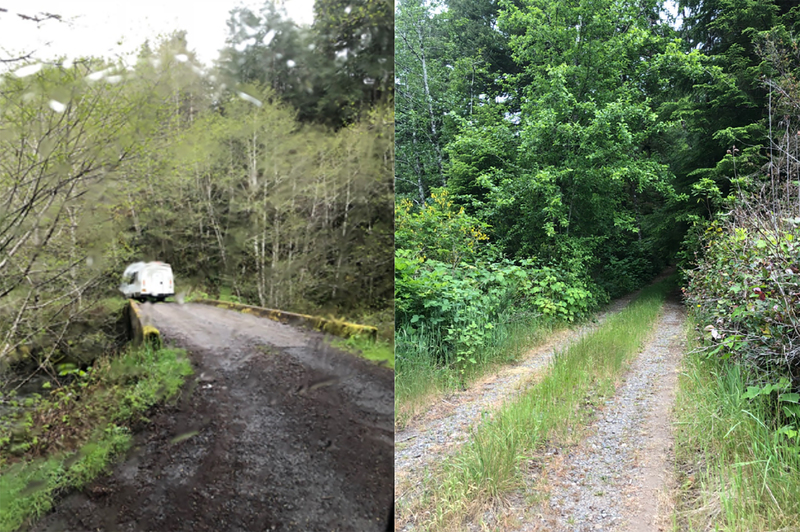 With improved road conditions and the installation of gates and directional signage, more people will choose to visit and recreate in the Elliott State Forest without accessibility and disorientation limiting them. More recreationalists paying to enjoy the Elliott will provide funds from possible use fees to create and improve quality while furthering the safety of the public and the land.